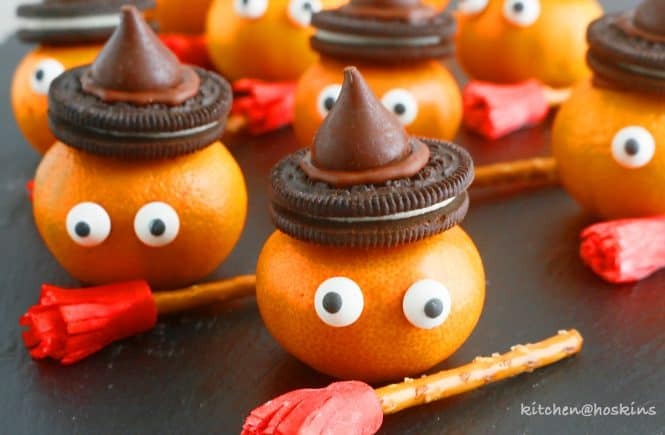 Adorable, cute, fun Halloween witch clementines will make a unique treat for all your neighborhood trick-or-treaters! Part healthy and part sugary treat is a win-win for both parents and kids. Aren’t these the cutest? If I may say so. We totally loved these and my son ate more clementines than he’s ever consumed in a year!!! Eating a fruit just got a lot more fun! 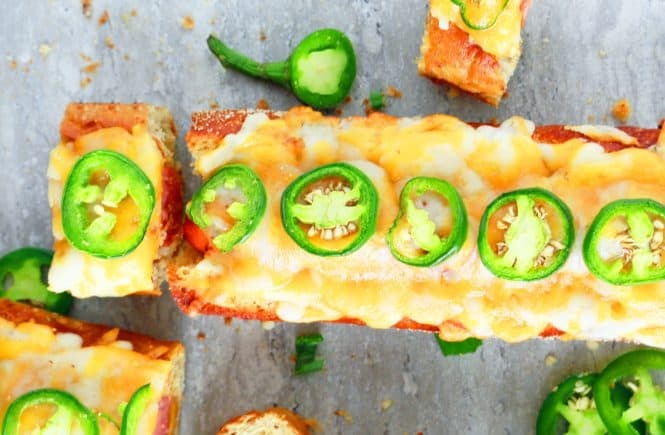 Yes, it is adorned with not-so-healthy options. Hey, it’s Halloween! There needs to be candy somewhere!! Wash clementines and towel dry very well or let air dry for a few hours. Remove stem ends (refer picture above-right). This gives them stability instead of wobbling around. Using a toothpick, place a dab of melted chocolate on the back of two eyeballs and stick to the clementine. Set aside while you make hats. 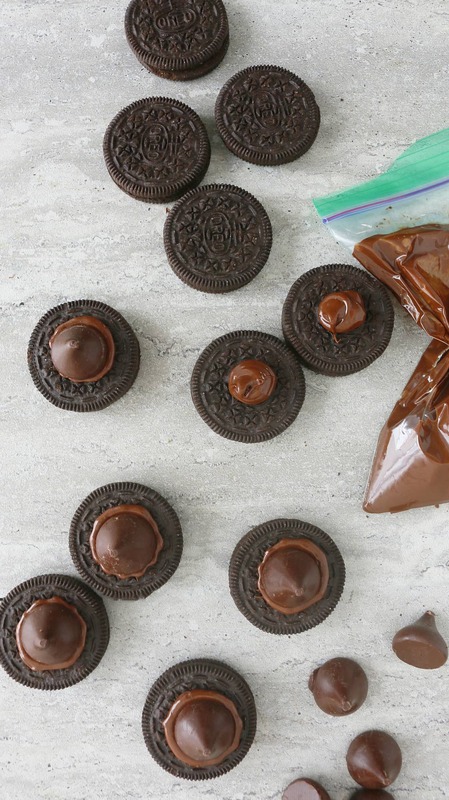 Spoon some melted chocolate into a small ziplock bag, snip off an end and squeeze about 1 teaspoon on an Oreo. Place a Kiss candy on it, pressing gently for the chocolate to come around the edges (refer picture below-left) . Ain’t pretty? 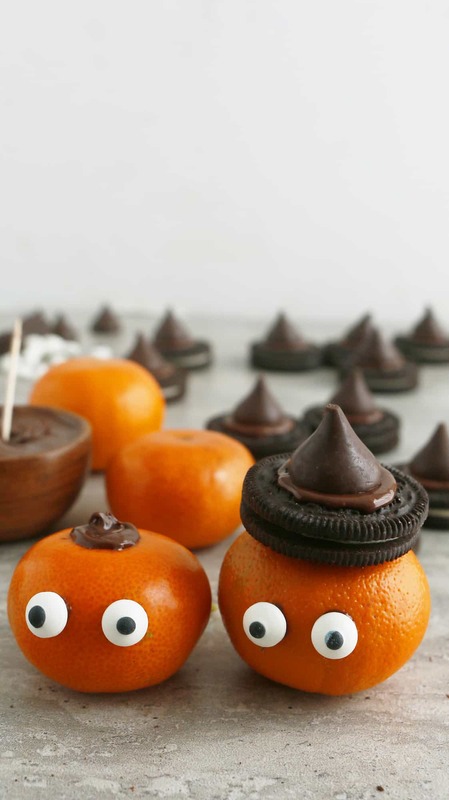 Squeeze some chocolate on top of the clementine (refer picture below-right) and stick the hat on it. Place clementines in refrigerator to set. How to make Witch brooms? Using scissors, trim all the way to about half the height. (Step 2, picture below-right). Dip the tip of a pretzel stick in melted chocolate and roll the fruit leather around it. 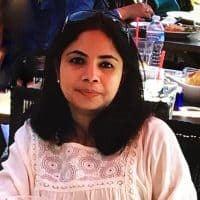 (Step-3, picture below-right). Using the tooth pick place a dab of melted chocolate at the end of fruit leather to help it stick well. Place brooms in the refrigerator to set (Step-4, picture below-right). How to eat these clementine witches? Step 1 – Eat the broom. 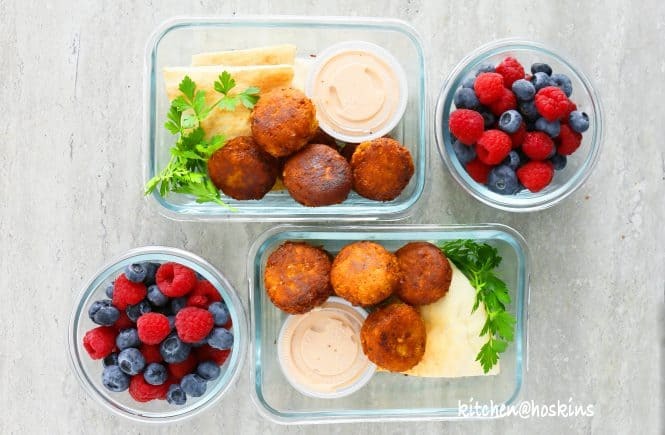 Step 4 – Open the clementine —> Finish healthy! 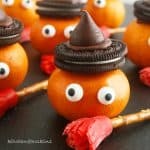 Adorable, cute, fun Halloween witch clementines will make a unique treat for all your neighborhood ghouls and goblins! 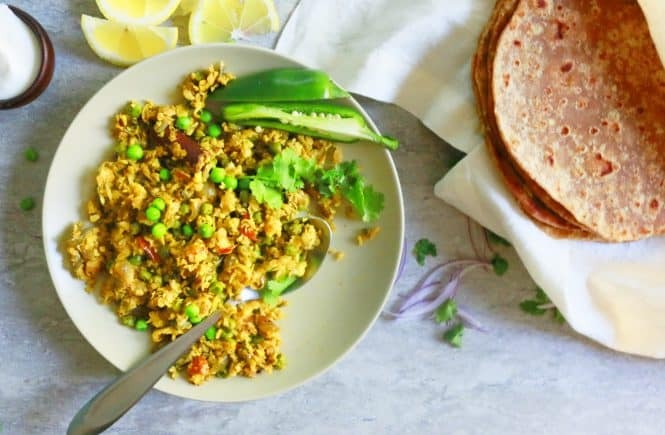 Part healthy and part sugary treat in a win-win for both parents and kids. Rinse clementines well and towel dry very well to remove all moisture and remove any attached stem ends. Place 2/3 rd of melted chocolate into a small ziplock bag, seal and snip off a corner. Place remaining chocolate in a small bowl and have a tooth pick handy. Using the toothpick, place a small dab of melted on the back of each balls and place two eyes on each clementine. 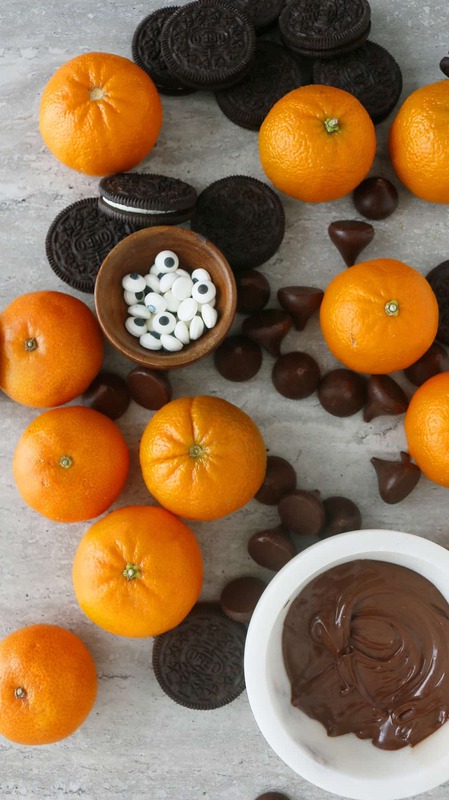 Squeeze some melted chocolate in the middle of an Oreo and gently place a Hershey's Kiss on top, pressing slightly so that the excess chocolate comes around the edges. Repeat to make 6 witch hats and set aside. 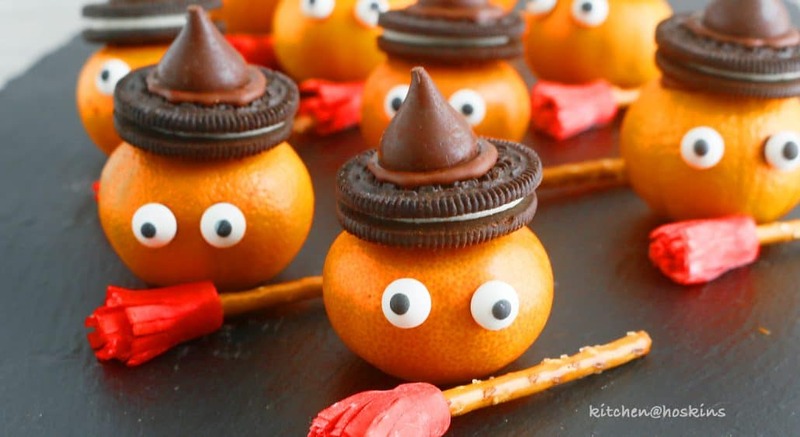 Squeeze some melted chocolate on top of each clementine and press a witch hat on top and press slightly to stick. Repeat process to make all witch clementines. 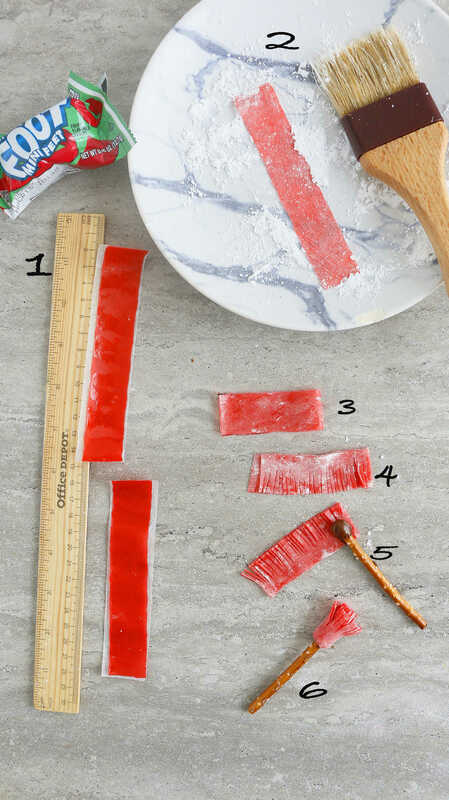 Cut 6 x 5-inch pieces from fruit roll ups. Dust a plate with confectioners sugar and have a pastry brush handy. 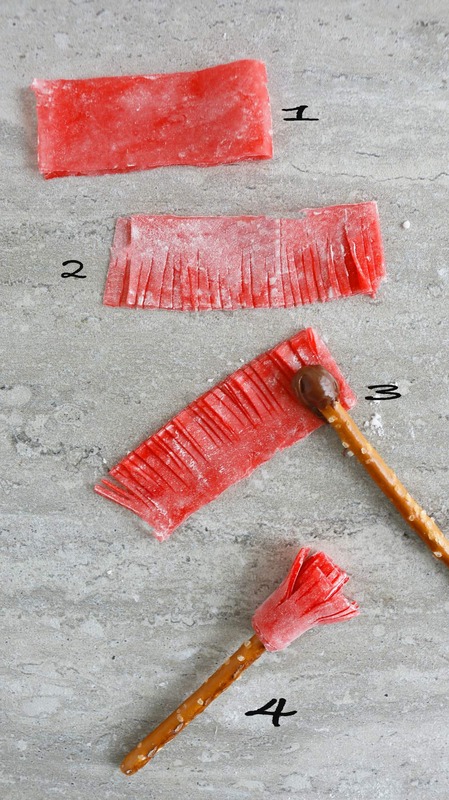 Working with one piece at a time, brush both sides of fruit roll up with confectioners sugar ( This helps the fruit roll up less sticky). Fold each piece in half and then cut thin strand across to about half the height (refer pictures). Dip the end of a pretzel stick in some melted chocolate and roll the fruit roll around it to form a broom. If the end doesn't stick well, then place a dab of melted chocolate to stick. Place all clementine witches and witch brooms in the refrigerator for chocolate to harden and set. 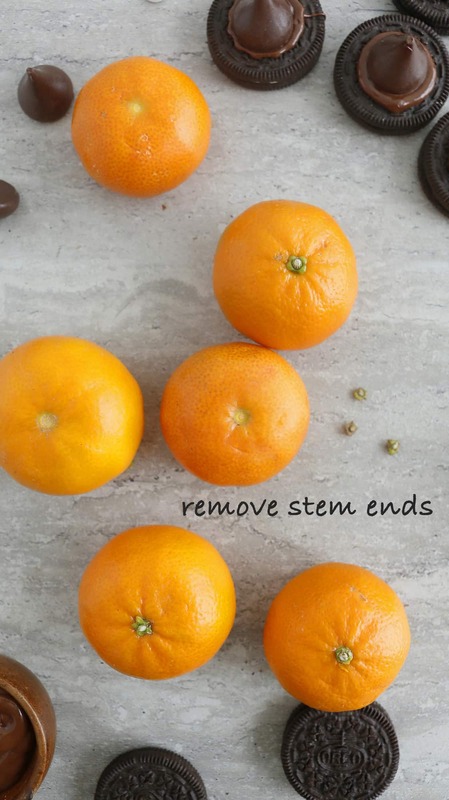 Kids will totally love making these clementines. Moms and Dads can assist with the witch broom. Thank you so much Kelly, these are perfect for school! 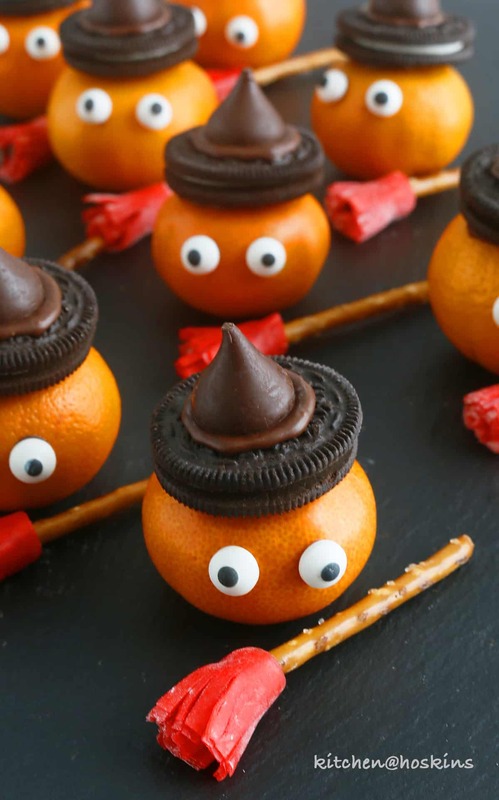 What an adorable little Halloween treat!! I am going to send a few of these to Oscar’s preschool class I think! Thanks Kathy, these are perfect for preschool! !